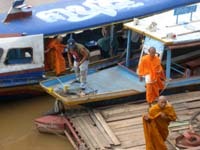 Go to From Pattaya to NongKhai Thailand by bus from Pattaya for the most convenient journey. It's on Sukhumvit road in Pattaya. Go up Pattaya Klang up to Sukhumvit Road and take a left. 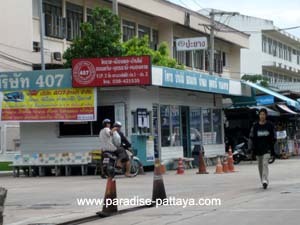 The bus station is right on the first Gas station about 200 Meters from Pattaya Klang. How Long Will The Ride To Nongkhai Thailand Take? The bus trip takes about 13 hours. I left at 8:00 P.M and arrived in Nong Khai around 8:30 A.M the next Morning. There are several buses leaving daily. Fares for the Bus from Pattaya to NongKhai are 506 Baht and 700 baht for V.I.P. 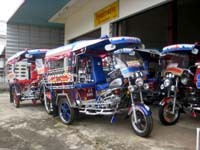 If you are going straight to the Laotian border you can take a Tuk Tuk from the bus station. NOTE: You may want to buy a ticket a day or two in advance. Going to stay in Nong Khai as I did? 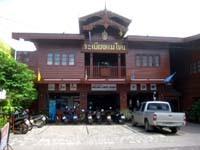 Walk to the Mekong River from the bus station in Nong Khai and you'll find a guesthouse there. 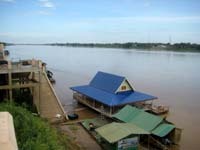 I stayed in the Mekong Guesthouse which has a wonderful view of the Mekong River and Laos on the other shore. 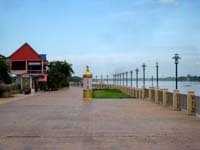 Nong Khai is a very relaxed Town by the Mekong River and seems to have an abundance of brand new Tuk Tuks. The drivers will ask you if you need a ride all over the place. The new promenade is very nice and they are building new shops and guesthouses all over the place. The adjacent market has everything you would expect on a Thai market. There is also a market right next to the bus station where you can eat and shop. Ready To Go To Vientianne? Once you've rested well and enjoy yourself - you can head out to Laos for your Visa run. 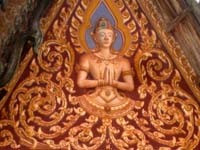 This is great that you've had the chance to see more of Thailand and South East Asia. Be sure to enjoy exploring Vientianne too. In my case I enjoyed looking at the similarities and differences between the two countries' temples and cities.